On March 17th a report appeared on the BBC News website’s Middle East and US & Canada pages under the title “Obama tells Palestinian leader to take risks for peace“. The messaging in that headline was repeated in the article’s opening lines. “US President Barack Obama has told Palestinian Authority President Mahmoud Abbas he must take “risks” for peace. 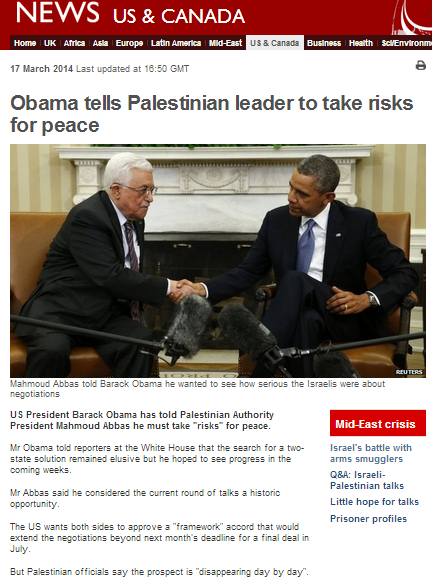 But did Obama in fact tell Abbas that “he” specifically – as claimed by the BBC – “must” take “risks for peace”? Not according to the transcript released by the White House which shows that Obama’s remarks were actually much less explicit and referred to a general need by all sides to “take some tough political decisions and risks” rather than being a demand or an instruction directed towards Abbas in person. Clearly the BBC’s reporting of Obama’s remarks is inaccurate and hence misleading to audiences. “Mr Netanyahu is insisting on Palestinian recognition of Israel as the nation-state of the Jewish people, but Mr Abbas has refused. The BBC does not bother to unpack the PLO’s claims of “implications for Palestinian refugees and Israeli-Arabs”, thus denying audiences the background necessary appraise the implications of that statement on the fate of negotiations. As has been the case in past reports, the BBC amplifies the Palestinian and Arab League position on the issue of Palestinian recognition of Israel as the Jewish state but disregards BBC editorial guidelines on impartiality by failing to inform audiences of the other side of the story. No attempt is made to explain the significance of the issue from the Israeli point of view and hence audiences are denied the background necessary to understand the Israeli demand. A lasting peace agreement cannot of course be brought about without recognition and acceptance of Israel’s existence in the region as an expression of the national rights of the Jewish people, along with an end to the kind of all too prevalent officially sanctioned incitement which encourages Palestinians (and others in the wider region) to continue to view Israel as “Arab land”. The recognition of Israel as the Jewish state by the Palestinians and the Arab world in general is hence critical to what must be the bottom line of any peace agreement worth the paper it is written on: the end to any future claims. From the point of view of many Israelis, the PLO’s refusal to agree to recognize Israel as the Jewish state as part of the potential agreement currently under discussion suggests that it will not succeed in bringing an end to the Arab-Israeli conflict. If BBC audiences are to be able to “participate in the global debate on significant international issues” they clearly need the BBC to adhere to its commitment to accurate and impartial reporting and to tell them the side of the story which this article ignores. The BBC was on the ground, while BBC Watch only had access to official transcripts. I trust he BBC. Millions of people do. Precisely. The BBC will not look at the Israeli point of view because the logical next step would be to question the justification for the Palestinian refusal to recognise Israel as a Jewish state, the homeland of the Jewish people. Once the question is asked, the answer is inescapable: the Arabs will not recognise the legitimacy of the Jewish state since to do so would mean giving up the goal of the destruction of Israel as a Jewish state. Only in its worst nightmares would the BBC ever venture into those murky waters: it would mean getting close to the heart of the Israeli-Arab conflict. And in turn it would mean no longer being able to blame Israel exclusively for the conflict. The Palestinians recognise the State of Israel, as do most other nations. no nation state recognised ‘the Jewish character’ as it’s a nonsense term, and would have implications for refugees, on all sides. it’s also not required for peace, so why be difficult? On the contrary, the state of Israel was established precisely because it was essential for Jews to have a homeland where they would not be brutalised and slaughtered. Ask yourself why the Arabs will not make a tiny compromise and recognise the Jewish character of the state while at the same time insisting that not one Jew wil be allowed in a future Palestinian state. You could also ask yourself why the Arabs have conducted radical ethnic cleansing of Jews from Arab countries since 1948, with the result that many Arab countries are now completely without Jews. I hope that makes it a bit clearer. The state of Israel has, on its long road to birth, had various ‘narratives’ regarding its inception – the one that you choose is, obviously, one chosen to promote your beliefs. Understandable, but not universally accepted, and that’s an understatement. Regardless of your #beliefs# , it certainly does not require the displacement of one groups of individuals to for the pleasure of another. Your assertion that ‘Arabs’, a vague ill defined term, refuse to make ‘tiny’ compromises is also troubling: these discriminative concessions you call for are nothing more than a wholesale expunging of the historically documented and merited claims that many native individuals of Palestine, its land and culture. It is disingenuous to pretend that this is a ‘small’ point – it isn’t. Your final point sadly also muddies the water by introducing an emotive element that is not relevant, and intentionally confuses issues on rights and responsibilities: Palestinians are not responsible for what ‘Arabs’ have done elsewhere, and the suffering of Jews does not justify imposing collective punishment on 4.5 million Palestinians. to pretend otherwise is morally repugnant. Sadly, you have not made anything clearer.